1. Keep your eyes open. The more you need to be careful about driving in severe weather. As much as possible, stay away from flood-prone areas and watch out for potholes, humps and other abstraction hidden under the puddle. 2. Never ignore road barricades and warnings from people. Most flooded areas do not have adequate road blocks that will leave you no choice then to take a turn. 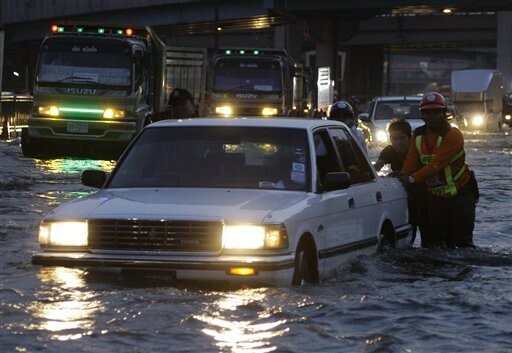 Most likely, good-hearted citizens and traffic enforcers will take time to warn you about impassable roads. Just heed their warning, turn around and look for alternate routes. 3. Think before you drive. Calculate the risks of driving in a flash flood. You may stop and see if other vehicles pass can by. Anticipate what would happen if water gets into the engine. Your car may stall in the middle of the road or incur irreparable damages in the engine. Follow your instincts if you find yourself alone on a flooded road. Better back -off if the water is below knee level and you are driving in a low-ride car. 4. Check the wet breaks. If the water gets into the tire rims, you might want to test your brake pads at low speed when you get on clear land. If the breaks won’t work, dry the pads by pressing on the break gently on left pedal as you run on low speed by pressing on the right pedal. 5.If your car stalls, call for immediate help. There are kind men who would volunteer to give your car a push to safety. But in cases your car got caught in a serious flood rifts, grab your phone and other important stuff in the car like your driver’s licence. Steer your vehicle until it goes to a safe stop and call for help to get you out of the vehicle. Call your car emergency assistance immediately. Stay safe this rainy season.